Though, iPhones are pretty safe compared to other smart phones, you always run the risk of accidentally losing valuable contacts from them. To prevent this issue, you can sync contacts from your iPhone via iTunes and store them on your computer. You can also make an iTunes backup to avoid losing important contacts. Here, we are going to tell you, how to sync your contacts from iPhone/iPad using iTunes into your computer, and how to extract or restore contacts from your iTunes backup. iTunes is a great way to sync calendars, contacts and other data between your iPhone and computer. So, when you want to export your contacts on iOS devices to your computer using iTunes, all you need to do is to sync your iPhone/iPad/iPod Touch contacts with iTunes and they will be stored on your computer. In this process, the iTunes software on your computer will scan the information and check for the most updated data. Then it will prompt you to select the information and initiate the sync process prior to exporting contacts from iTunes. 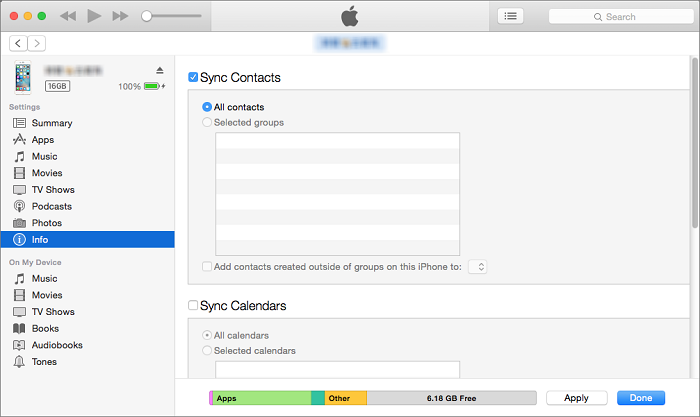 As of now you can only sync calendars and contacts if you are using OS X 10.9.5 or later, other data types require iCloud to get synched. Let's check out the step-by-step process for exporting contacts from iTunes to your computer. Step 1: Make sure to install and update the latest version of iTunes on your computer. Launch iTunes and then connect your iPhone/iPad/iPod Touch through a lightning cable. Step 2: On the iTunes' main screen, tap on your device icon (iPhone/iPad/iPod Touch) and then select the 'Info' option. 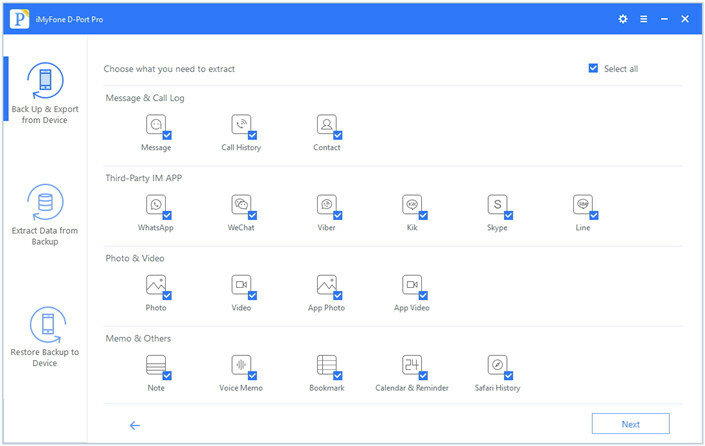 Step 3: You will find the 'Sync Contacts' option after clicking the 'Info' tab. Select the checkbox next to 'Sync Contacts' and then choose 'All Contacts' option. Tap the 'Sync' button after that, and it will start exporting contacts from iTunes and sync them with your computer. When it comes to export contacts from iTunes backup onto your computers, you have a try with the third-party tools serving the same purpose. There are amazing tools like iMyFone D-Port Pro which can extract contacts from your iTunes backup without any hassle. iMyFone D-Port Pro can selectively export more than 18 types of data from your iTunes backup, iCloud backup and even iPhone. You can check the data types here. Here comes the step-by-step guide to export contacts from iTunes backup to your computer using iMyFone D-Port Pro. First of all, install the software after downloading and then launch it. 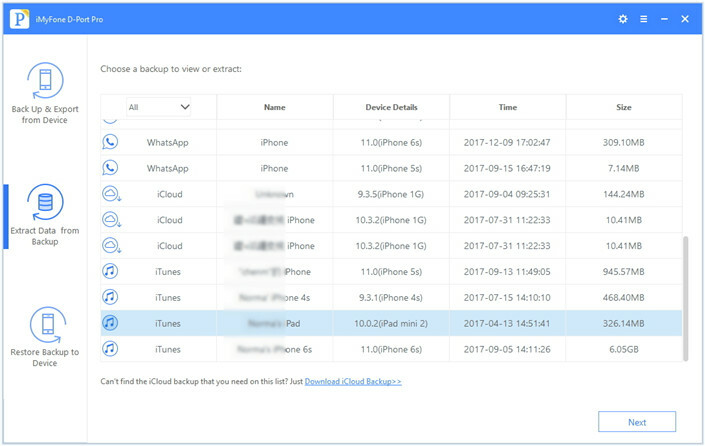 Connect your device and then tap on 'Extract Data from Backup', and select the iTunes backup that you want to extract contacts from. The next screen will show you the list of data type that can be exported. You can select 'Select All' if you want to export all the data to the computer. Here, we will check only the 'Contact' option and then tap 'Next', to scan the backup. Once the above data gets scanned and analyzed, you can preview the list of items. Now, select the desired contacts and then tap 'Extract'. It will export the contacts into your computer without any delay. iMyFone D-Port Pro can not only help you export certain type of data from iTunes backup, but also gives you the flexibility to restore an indivadual app from your backup to your iPhone. 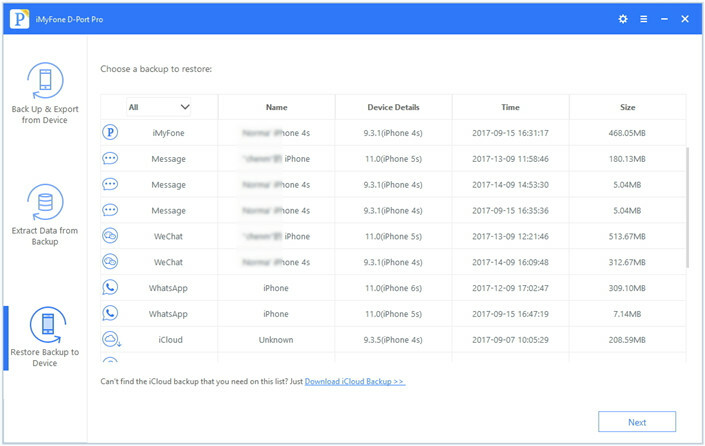 To restore the data you have backed up earlier, iMyFone D-Port Pro can selectively restores WhatsApp, WeChat, or Messages from iTunes/iCloud backup for now. The new version will support to separately restore more data types including contacts from iTunes backup instead of the whole backup. 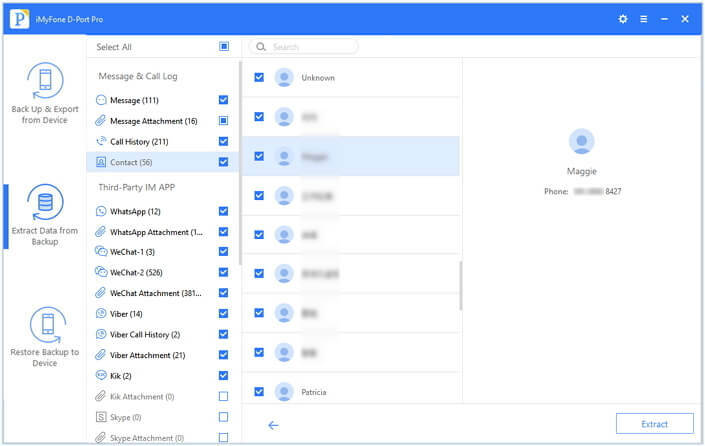 Here is the step-by-step process to selectively restore data using iMyFone D-Port Pro. 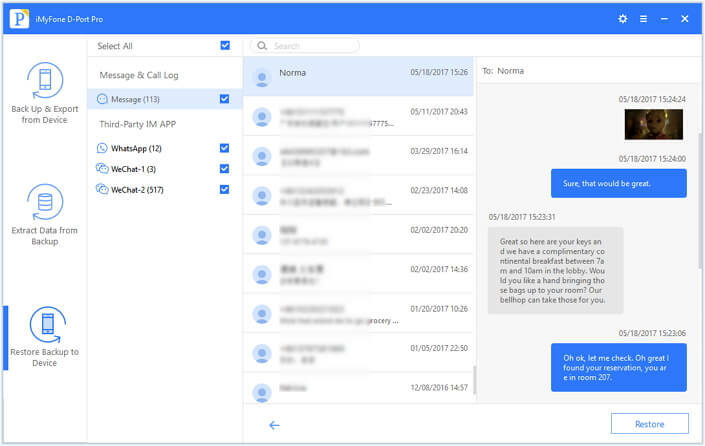 Once you install iMyFone D-Port Pro, launch it and connect your device with the computer. 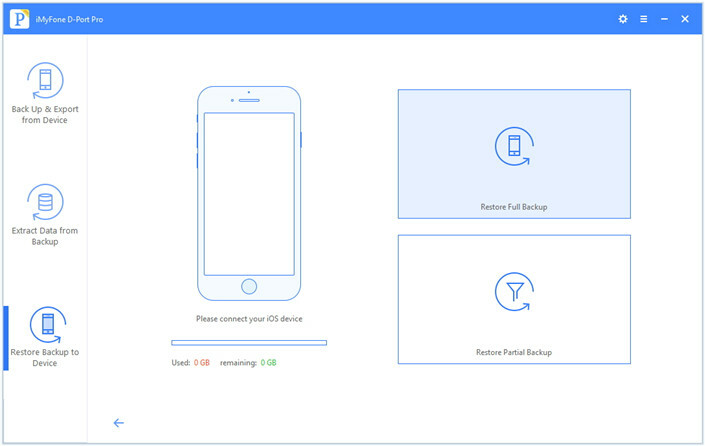 On the main screen, click 'Restore Backup to Device' from the side panel. Now, you will be prompted with backup options such as 'iTunes' or 'iMyFone D-Port Pro'. Here, you need to choose 'iTunes' backup and confirm. When you see 'Restore Full Backup' and 'Restore Partial Backup', choose the later and then tap 'Next' to continue. Now, the screen will show you the list of data types you can export. Tick the 'Message' option for example and then tap 'Next'. You can choose Contacts in the next version. It will initiate the scanning process. After that you can preview the data to be restored. 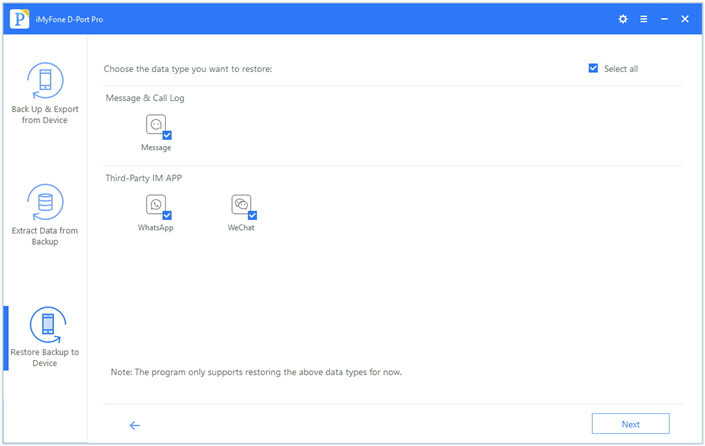 Now select the data type and tap 'Restore'. When restore is complete, you will be notified.